I meant to do a write up about this during the year, but forgot. So here’s a short, but long overdue post about how I assign seats. Surprisingly, before this year I never assigned seats (gasp), so I really felt the need to post about this strategy. Oh, and I can’t take credit for this…John Scammel put me on to it during his session at TMC14. Awesome dude. It’s a pretty simple technique that goes a long way at efficiently grouping students in diverse ways. During the first month of school or so, I assign each student four different seats. Each seat is assigned based on academic ability, group dynamics, proximity to me, students that can’t see the board, etc. These four seats are their assigned seats for the semester. I call each of the four seating arrangements a “quadrant”. 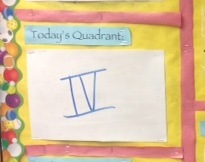 When students arrive for class each day, the day’s quadrant is posted on the bulletin board by the door. They walk in, check out the day’s quadrant, and go to their seat that corresponds to that quadrant. Because I strategically place students in each quadrant, I select the quadrant based on that day’s activity. Some days require Quadrant I while on other days Quadrant III may provide a better set up. Each seating arrangement provides strengths and weaknesses to the class dynamic, so I vary the quadrant day to day. There were even a couple days during the middle of class I had students change quadrants based on how the lesson was going. It worked well last year. It afforded me another layer of differentiation and flexible grouping, which was nice. Plus, the majority of the students enjoyed having a variety of seats around the room. The only hiccup I came across was students not remembering where they sat. Crazy. I guess they weren’t accustomed to remembering four different assigned seats. I probably should have posted up the seating arrangement for each quadrant somewhere in the room, but I was lazy and expected them to just know. Next year, I’ll post them. This entry was posted in strategy and tagged arrangement, assign seats, assigned, assigned seats, chart, seat, seating, seating arrangement, seating chart by brian. Bookmark the permalink.